• Abuse – Your abusive partner lashes out with aggressive, belittling, or violent behavior. The abuse is a power play designed to show you "who is boss." • Guilt – After abusing you, your partner feels guilt, but not over what he's done. He’s more worried about the possibility of being caught and facing consequences for his abusive behavior. 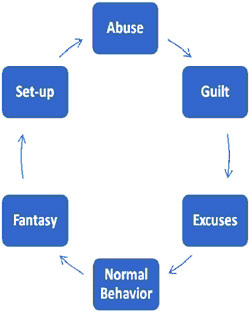 • Excuses – Your abuser rationalizes what he or she has done. The person may come up with a string of excuses or blame you for theabusive behavior—anything to avoid taking responsibility. • "Normal" behavior — The abuser does everything he can to regain control and keep the victim in the relationship. He may act as if nothing has happened, or he may turn on the charm. This peaceful honeymoon phase may give the victim hope that the abuser has really changed this time. • Fantasy and planning – Your abuser begins to fantasize about abusing you again. He spends a lot of time thinking about what you’ve done wrong and how he'll make you pay. Then he makes a plan for turning the fantasy of abuse into reality. • Set-up – Your abuser sets you up and puts his plan in motion, creating a situation where he can justify abusing you.